Here’s a hypothetical situation. Suppose you’re driving with your husband, on the way home from a weekend trip. You both decide to take a minor detour to stop and see a major tourist attraction with some historical and geographical significance. Oh yeah, hypothetically, you’re in Germany and you’re stopping in Koblenz to see a very large statue at the confluence of the Mosel and Rhine rivers. Hypothetically, it’s a very nice Easter Sunday, there are large crowds of Germans out doing the same thing you’re doing and because of that there’s just no where to park. Finally, after hypothetically driving around for twenty minutes or so, you find yourself on a side street and your husband hypothetically says, “just pull over there.” You’re response to this hypothetical statement is, “That’s not a legal parking spot, we could get towed.” Your husband hypothetically responds, “Don’t worry, it’s Easter Sunday, there won’t be any German police around here.” So what would you do in this hypothetical situation? So let’s say you hypothetically go ahead and park in the illegal parking spot. You enjoy a couple of hypothetical touristy hours. Upon return to the hypothetically illegally parked car you discover that the car is indeed gone. Should you ever find yourself in a hypothetical situation like this, while you’re husband is swearing and ranting about how screwed “we” are, here’s what I recommend. Take out your iPhone 4, tap in Koblenz police, call that number and tell them you think your car has been towed. They’ll give you the number of the folks in charge of towing. Those people will tell you where the car has been moved. Then walk across the street to a taxi and give them the address where the car is located. Follow these recommended procedures and it will only take 15 minutes from the discovery of the missing car to unlocking the missing car’s doors and driving away. Apparently, in a hypothetical situation like this, the German police would have a car towed to a non-descript parking lot, left there with the ticket under the wipers. No impound; just waiting for the hypothetical law breaker and his wife who told him not to do it in the first place. Of course, since this is a hypothetical situation this is not a picture of our car. 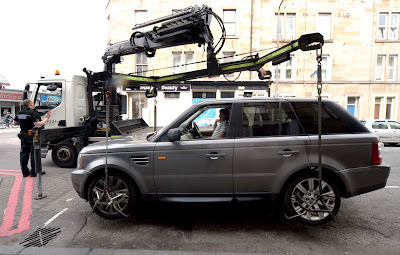 But I imagine that this would be the type of system they would use in just such a situation since if you left the electric emergency brake engaged and found it still engaged they would have to lift the vehicle by some means. Hypothetically speaking. Hypothetically, the fine for a situation like this would be only €15 for illegally parking. Of course, hypothetically, you probably have to wait for the towing bill to show up in the mail. So here's my final bit of advice should you find yourself in a situation like this. Always have your iPhone with you and don't listen to your husband; one is always smart, the other just once in a while. Hypothetically, you went along with the "poor" judgement, because of his excellent track record? yRgbSm! Something about Easter and hypothetical eggs. Cute and SO FAR, cheap hypothetical lesson! Much less than the ticket would be in Texas and much, much quicker to resolve....let us know how much the hypothetical towing is. Cool tow truck since it wasn't your car! Great blog. I think you said hypothetical or hypothetically 18 times haha. The tow truck looks pretty cool. I loved hearing your story!